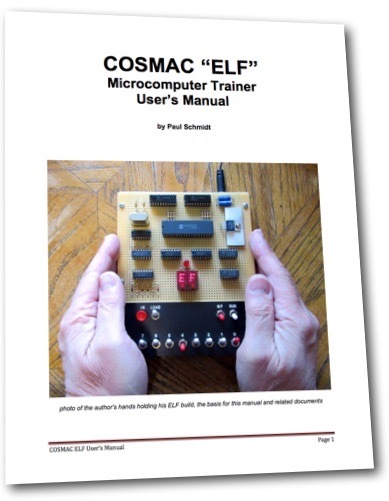 Details on the COSMAC ELF Microcomputer Trainer User's Manual and build instructions by Paul Schmidt. After creating a beautiful replica of the original COSMAC ELF, Paul Schmidt documented the heck out of it and made his hard work available for others to learn from. If you want to build one of the simplest computers of the mid-1970s, this is definitely the place to start! Paul granted permission for his work to be made available here. You can find links on the Books & Papers page for the full ZIP file containing the manual, schematic, parts list and templates, or you can just browse the PDF manual to learn more about the machine. Build one of your own, then drop by the forum and share your experience!